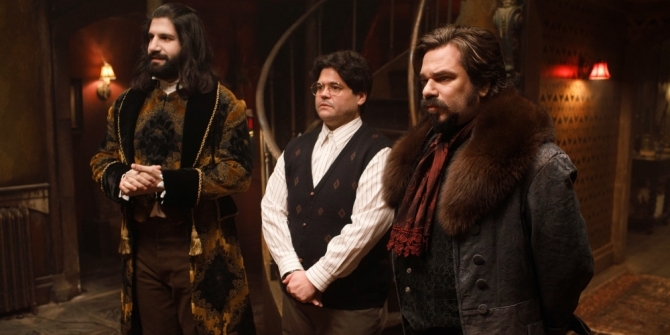 Ironically, What We Do In The Shadows, a show about the immortal, is lacking something vital, and it may just be a pulse. Before making the jump to the Marvel Cinematic Universe, Thor: Ragnarok director Taika Waititi tried his hand at revamping (no pun intended) another subgenre that had been sufficiently beaten to death: vampire fiction. Alongside fellow Kiwi Jemaine Clement, Waititi co-wrote, co-directed, and co-starred in a feature-length mockumentary about the day-to-day of a bloodsucker entitled, What We Do in the Shadows. Based on the short film of the same name released nearly a decade earlier, the 2014 release received critical acclaim out of Sundance and even spawned a spinoff series, Wellington Paranormal, which will roll out a second season later this year in New Zealand. Stateside, however, it wasn’t until early 2018 that Clement was tasked by FX to translate his and Waititi’s highly-successful brand of undead tomfoolery to the small screen. Unfortunately for the viewership, myself included, Waititi and Clement – both of whom do serve on the show in a creative context – will not reprise as Viago and Vladislav, respectively, opting to introduce us to an entirely new, but nonetheless hilarious, coven. Presented in a documentary style similar to that of The Office, albeit lacking the emotional core of the NBC sitcom, What We Do in the Shadows diarizes the commonplace of an immortal clutch who’ve co-inhabited for many a century on Staten Island. Amongst the colony is the self-appointed leader of this chapter of the undead, “Nandor the Relentless” (Kayvan Novak) – a warrior from the Ottoman Empire – his decade-long familiar (servant) Guillermo (Harvey Guillén), and married couple Laszlo (Matt Berry) and Nadja (Natasia Demetriou). Far and away the most amusing addition to the dramatis personae, though, is Colin Robinson, portrayed deftly by Mark Proksch. Robinson is an energy vampire, meaning he would rather feast on the vitality of humanity than their gooey gore. The perpetually middle-aged man has a veritable smorgasbord of prey at his disposal, too, due to his employment at your run-of-the-mill office, overloaded with cubicles and unsuspecting game. You’ve most certainly run into his type before, all monotonous and bothersome. That being said, in real life, where the experience is something comparable to a nightmare in the fictional realm of What We Do in the Shadows, one cannot wait for their next encounter with the one they call Colin Robinson. While Robinson is undoubtedly the highlight of this farce, rest assured that the laughter does not live and die with his presence (although, it should be noted that one can’t help but feel Colin is endlessly lurking in the shadow). Half a decade after effectively popping the self-serious bubble surrounding vampire culture – following Twilight mania and Thomas Alfredson’s superb drama, Let the Right One In – Waititi and Clement clearly aren’t running out of rib-tickling material and situational silliness to enliven their otherwise withered premise. Yes, unfortunately, in the transition from a short film to a full-length feature, and now to a television series, What We Do in the Shadows has, inevitably, lost steam, and that shouldn’t come as a shock. Look, there’s no denying the Staten Island coven will keep you chuckling from week to week, and maybe that’ll be enough for some to sink their teeth. Howbeit, the lack of an affecting nucleus has this one-trick pony unsurprisingly on life support, or, at the very least, bedridden, less than halfway through season one. Basically, sooner or later, a beam of sunlight will illuminate just how narrow and threadbare the narrative has become. The Longevity and stagnation of the small screen treatment notwithstanding? From what I’ve seen thus far, this humorous, yet hollow FX series is nowhere near as newfangled, or down-right funny as the original, sub-ninety-minute feature. Does that mean it’s not worth a go? Of course not. Especially if you’re looking for more of the same from Waititi and Clement, and make no mistake, What We Do in the Shadows is more of the same, for better, and for worse. Bottom line is to the detriment of Clement, Waititi, and FX, the small screen adaptation of What We Do in the Shadows is nothing more than a carbon copy of the full-length (if you can call it that) feature in just about every way, making it damn near impossible to shake the feeling that we’ve seen all this before.